One of the best ways for any athlete to boost his or her acceleration, top speed, and agility is to practice sprinting against resistance. This training technique has been around for decades, but advances in equipment and gear make the methods of practicing sprint-resistance drills more widespread, safe and even more fun. Whether you are an athlete or a coach, you may want to add a variety of the following resisted sprint exercises to your workout bag of tricks. The main reason to do these drills is to help athletes build functional power to generate faster accelerations and attain higher maximum speed. Resisted training helps athletes increase their speed-to-strength ratio which improves their ability to generate greater force during sprint starts, or during any quick accelerations while running. It sounds complicated, but it's a fairly simple concept. The more power an athlete generates when pushing off against the ground, the faster they will propel themselves away from the ground. It's the key to sprinting. As with other forms of strength training, the best way to build muscle is to overload it by working it to fatigue and then allowing it to rest and rebuild. That is typically done in the weight room and that works well. In fact, squats and deadlifts are ideal for building power. But weight room training doesn't always build functional strength, and it doesn't always translate to more speed on the field. Building functional strength, power and speed require that an athlete use the same muscles in the same movement patterns as during their sport. It's not always easy to find ways to overload the muscles while performing the movement used during a sport. Two of the best ways to accomplish this are to increase either the athlete's body weight with the use of weight vests or to add resistance to the movement. Some of the best ways to add resistance to movement include the use of weight sleds, parachutes, hills, stairs and even sand. The most important factor of a successful sprint-resisted training exercise is to increase the drag on the athlete without altering good running mechanics and form. This is often where athletes and coaches go a bit sideways in the training principles. To maintain proper form, an athlete needs to add resistance extremely slowly and pay attention to any changes in form. As soon as running form is compromised, the effect of this sort of training will be reduced. One rule of thumb is to add no more than 10 percent resistance and make sure the load doesn't cause the athlete to slow more than 5 percent from his or her maximum, un-resisted speed. Sprinting with a parachute attached to the athlete via a harness is a great way to begin resisted sprint drills. These parachutes can add a little or a lot of resistance and rarely affect the running form. Have a partner hold the parachute at the start of the sprint to get the chute properly inflated. Speed parachutes create an overload on the muscles used for sprinting during the sprint. The faster the sprint, the more resistance is generated, so parachutes create an even and steady resistance. General recommendations are to use 20 to 50-yard sprints repeated for three to ten repetitions with a long rest between sprints. Some coaches have the athlete release the chute after 20 yards to create additional speed bursts. 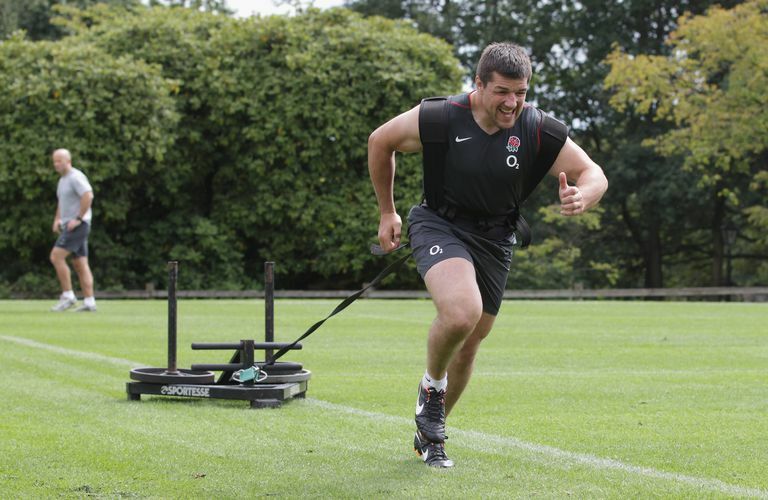 Using a weight sled or otherwise dragging weight while sprinting creates a constant load on the muscles used for acceleration and top speed sprints. It's basically a mix of sprint drills and weight training. When done correctly with proper form, weight sleds are a great training tool. The basic structure of the drills is the same as when using a speed parachute. Most weight sleds should be pulled on grass or turf, and the amount of weight should be varied to accommodate the surface resistance. Again, don't use so much weight that your speed drops more than 5 percent from your regular sprint speed over the same distance. Weight vests can increase the resistance during sprint drills as well. As long as form and speed are maintained, most athletes can see good results using a well-fitting vest. Another option is to wear the weight vest while stair or hill running, or while practicing jump and land drills. Speed athletes will usually start with no more than five to eight pounds of weight. Practicing skills drills while wearing the vests also help build power and strength through a variety of sport-specific movement patterns. If you have limited equipment, hill and stair drills can also provide a good resisted sprint training workout. While it may not mimic the movement patterns in a given sport, it will create a full-body overload and help an athlete build functional and dynamic strength and power. Start slowly to avoid injury or delayed onset soreness, and gradually build up intensity and time. Use the return phase as recovery, rather than sprinting back down. The repetitions will vary based upon the length of the stairs, so work with your coach to determine the best routine. Sand is one of the most challenging surfaces on which to practice sprint drills. The softer the sand, the more force an athlete will need to produce to move forward. It also requires more energy, more balance, and more strength than a hard surface. The downside of sand sprints is that it is nearly impossible to maintain proper running form due to the sliding motion of the surface. So, while it's a killer workout, and will build speed and power, it's not ideal for all athletes. For ultra-intense athletes, consider adding sandhill sprints, and then prepare to suffer.